Bonnard provokes nostalgia – all those sunburst gardens, shady book-supporting desks, sinister cats and naked bints in baths (together with their underlying psychological tremors) recall times past in many climes. As does the NFT. It will ever be the NFT for those of a certain age. Reincarnated many times since I proposed marriage while waiting to see Hamlet Goes Business, whatever is done to the Riverside Bar it will never recapture the tobacco-stained, schlobby fading glory of my first visits with Clive James in my pocket. The offer now is Italian small plates, which was exactly the kind of thing we were looking for. We took a spread of cold and warm things, including a vegetable pizza (vulcan was at the pizza forge, doing a damned fine job as far as I could see). This brought high quality salami and olives, zucchini (battered) and excellent pizzette. A bottle of house white did the job very well and I’m glad to report that the service was excellent. Though perhaps less so for the lady next to us who had a glass of white poured down her dress. So, a vast improvement in food, service and atmosphere, I’d like to go back some time and try out the rest of the pizza. Alas, we didn’t have the time to linger and watch some Antonioni, spontanaiety being more elusive thanks to my recent marriage to Mrs Woof. In my London lifetime Somerset House has been transformed from a large office block with a beautiful gallery* nestled within to a cultural complex of public areas, gallery spaces, university, pop up cinema, music venue with a variety of shops, restaurants and cafés to suit most pockets. ** This process, being gradual, has largely been unheralded compared to the flashier developments on the South Bank, at Tate or at Kings Cross. 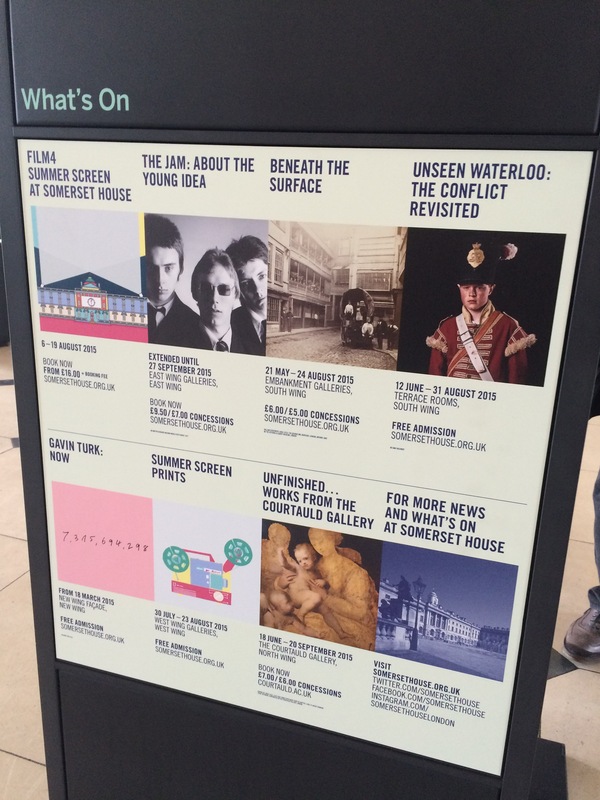 The purpose of this blog is to celebrate Somerset House and to draw attention to two exhibitions in particular that merit a visit before they close. One the joys of the building is its nooks and crannies. I’ve never made it to any of the site specific shows that from time to time take people through the building and use its corridors and chambers as a production backdrop and take you through the belly of the beast. But if you want a structured visit to the site (bowels included) you can join one of the regular tours that are run by Blue Badge Guides each Tuesday. Highly recommended. 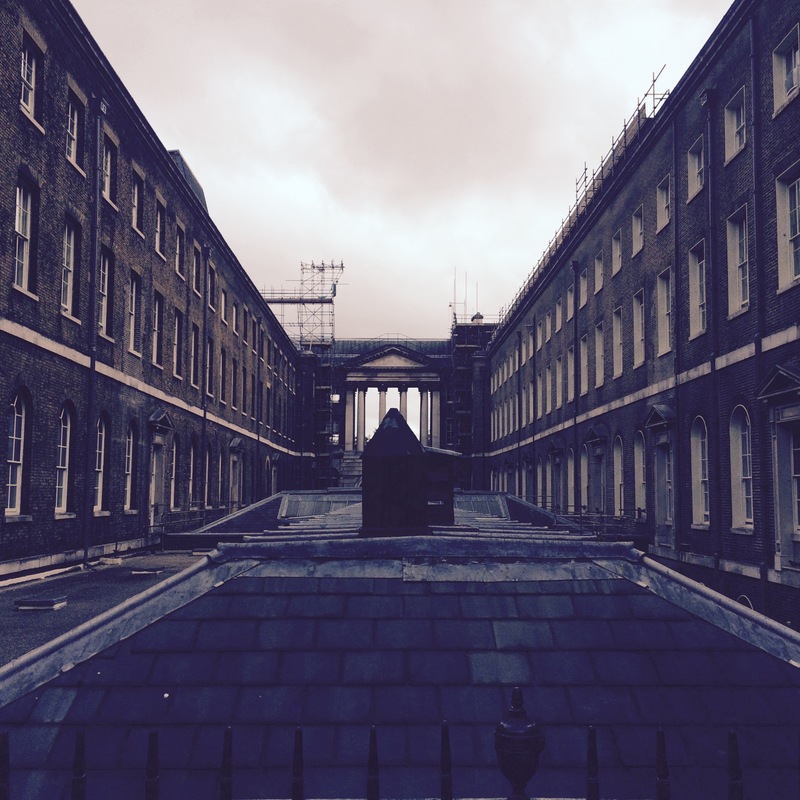 If you prefer to browse the site in your own time Somerset House offers a palimpsest of architectural styles, textures in stone and brick, and odd perspectives. The newest of these (for me at least) is the New Wing***, entered from the courtyard through a suitably forbidding gate given that it once housed the offices of the Inland Revenue. Nowadays it has a couple of restaurants (I shall try them soon I hope) and exhibition space. 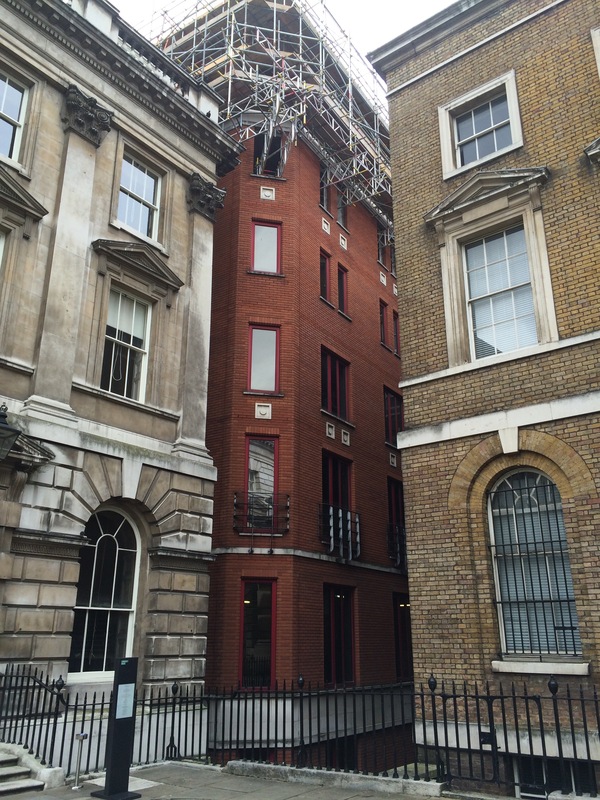 But what I liked about its being open to the public are the quirky views you get of familiar buildings. Look to the left as you pass through the gate and you get a deliciously symmetric view of terracing closed off by a classical gateway. In the nineteenth century the older block would house Naval clerks and administrators dealing with Sick and Hurt, Navy Pay and Victualling. To the right the newer building housed the beancounters of the Revenue. Each of them staring across a terrain of slates and chimneys covering yet more warrens of offices and stores below ground. The Naval connection especially is a reminder of how something that was once fundamental to London life, the sea and the people who worked on it, is somehow now marginal. Look to the right and you have a little play of textures, of nineteenth century stone and brick sandwiching a twentieth century interloper. Down the alley between red and yellow brick there’s an owl. Go through the door to the other side of the building on Lancaster Place and you see a fresh perspective of Brettenham House, one of my favourite buildings in London. Not because it’s spectacular (far from it) but just because it occupies a slither at the north end of Waterloo Bridge in a very dignified way. I especially like the neo-classical lettering above the main entrance. Brettenham House, better seen in the flesh. 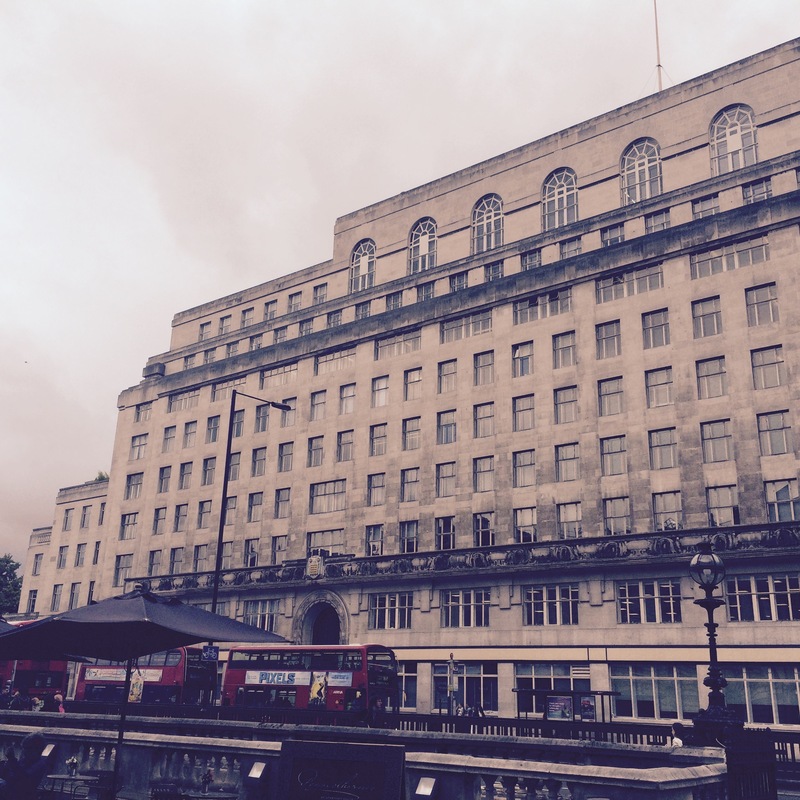 If you like it as much as I do you can take a coffee on the terrace and watch the buses pass by in front of it. The terrace on the river side of Somerset House is rather disappointing as a viewpoint owing the plane trees blocking the way. Lancaster Place terrace offers the opportunity to lounge around while hassled commuters, harum-scarum cyclists and wide-eyed tourists tootle along in front of you. I’d earned my coffee through having visited not one but two exhibitions beforehand. The second of these was Unseen Waterloo: The Conflict Revisited. This was a peculiarly fascinating show. 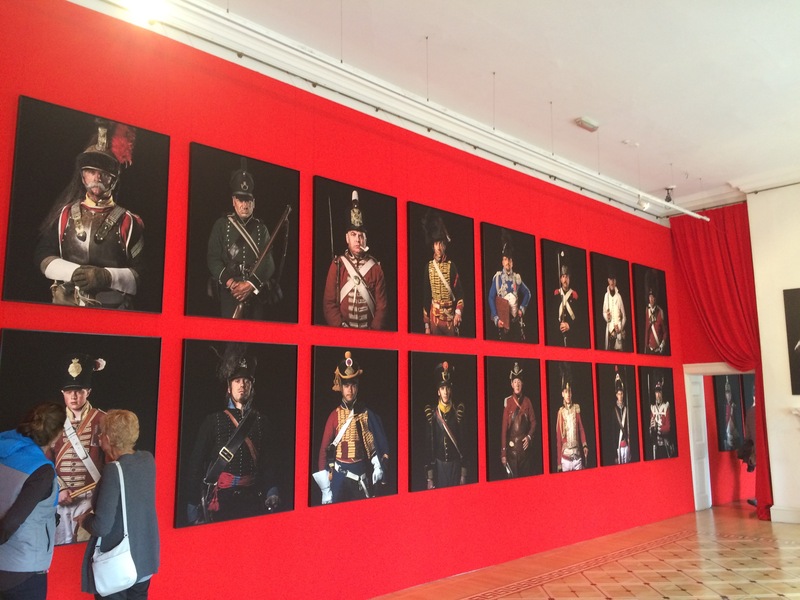 The photographer Sam Faulkner has 80 life-size portraits of men who re-enact the Battle of Waterloo of a variety of ranks, regiments and nationalities. This against a backcloth of the same fabric used to make British redcoats. At first I was struck by the beautiful construction of the uniforms; the sheer volume and intricacy of tailoring; the elaborate practicality of pockets and appendages; the decorations at once obscure and familiar; the cap badges and carefully delineated ranks; the equipment profuse and murderous (including an axe). Then I saw that the diversity of paraphernalia mirrored the diversity of the people (although I saw no women, it would have been good to have had some camp followers among the militaria). All ages, including boys, from all over Europe, reflecting the fact that the battle itself two hundred years ago was fought not between Englishmen and French but between all the territories of Europe. And also that within the British Army there was a great agglomeration of men from around the Empire (as it then was), the former colonies in North America and subjects of the King in Europe as well as those of his allies. Such too would have been the case in the Royal Navy, in whose former rooms the exhibition is situated. The exhibition is free and it is a stunner. I’d come from a tremendous (and free) exhibition, Out of the Chaos, by an organisation of whose existence I was completely unaware, Ben Uri. The exhibition has a dual purpose. 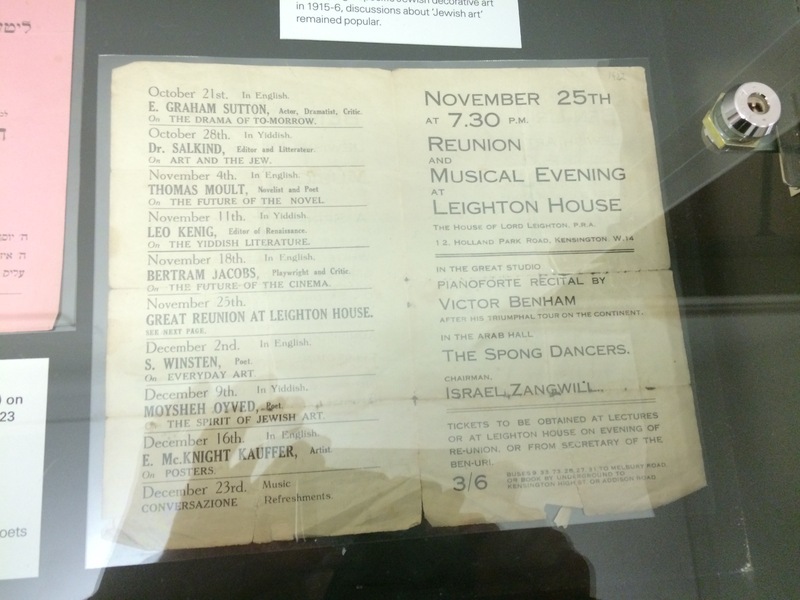 The first is to celebrate the hundredth anniversary of the foundation of Ben Uri, an organisation founded to promote the work of Jewish artists living and working in London following the wave of emigration from Eastern Europe in the early twentieth century. The Spong Dancers in the Arab Hall. Who wouldn’t want to see that? If you have any familiarity with the history of the East End names like Israel Zangwill, David Bomberg and Jacob Epstein will leap out. 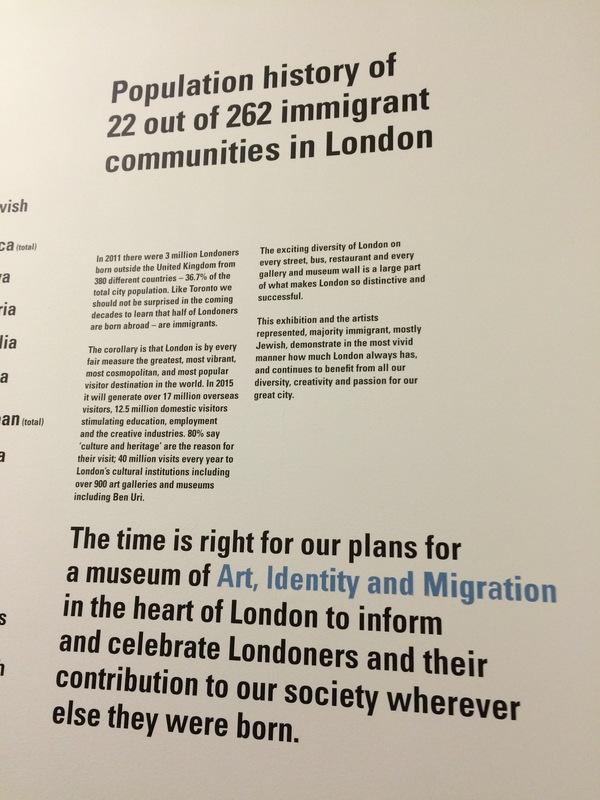 What I liked about the exhibition was that it weaved together artwork and documents to tell the story of the Jewish community in London through the twentieth century and into the present day. From a community of outsiders, with separate language and culture very quickly (and not without challenges and opposition of course) Jewish artists and intellectuals soon came to be central to the cultural life of the capital and by extension, the nation. In the room dealing with World War 2 exhibits on the consequences of the Holocaust underlined the evil effects of racist ideology. Britain itself took the ruthless decision to intern a large number of Jews of German origin and this is covered in documentation and artwork of camps on the Isle of Man. But there is also a small, dignified illustration by Barnett Freedman of D-Day Preparations showing a group of men being addressed in a hall in the run up to Operation Overlord that illustrates how the Jewish community was shoulder to shoulder with the rest of Britain in the battle for a democratic way of life. My own favourite picture was Mornington Crescent by Frank Auerbach. It is intense, joyful and London in sticky bright abstraction. The exhibition’s second purpose is to campaign. Ben Uri is now looking for a permanent home for its collection which grows as the organisation continues to sponsor contemporary artists. You can read about the campaign here at their blog. I really want them to succeed and plant a museum in a space in the centre of the city that will act as a beacon of tolerance in these often intolerant times. The basement where the exhibition takes place is the only downside to an extraordinary must-see show. These works need room to breathe. However, it does afford a glimpse of another immigrant success story, whose leadership saw this country through the trials of the French Revolutionary and Napoleonic Wars brought to mind in Waterloo above and in the history of the Navy Board, for whom Somerset House was built. 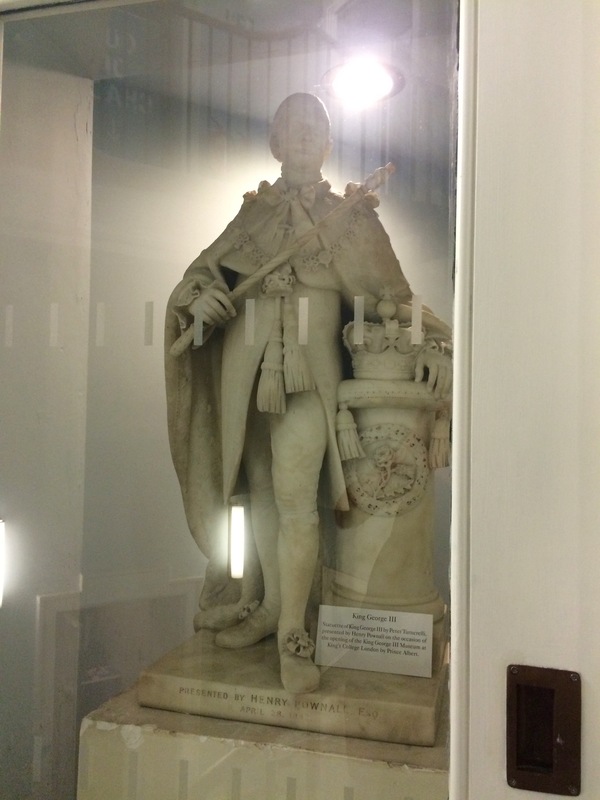 George III – wartime leader; patron of the arts; sion of a successful immigrant family. 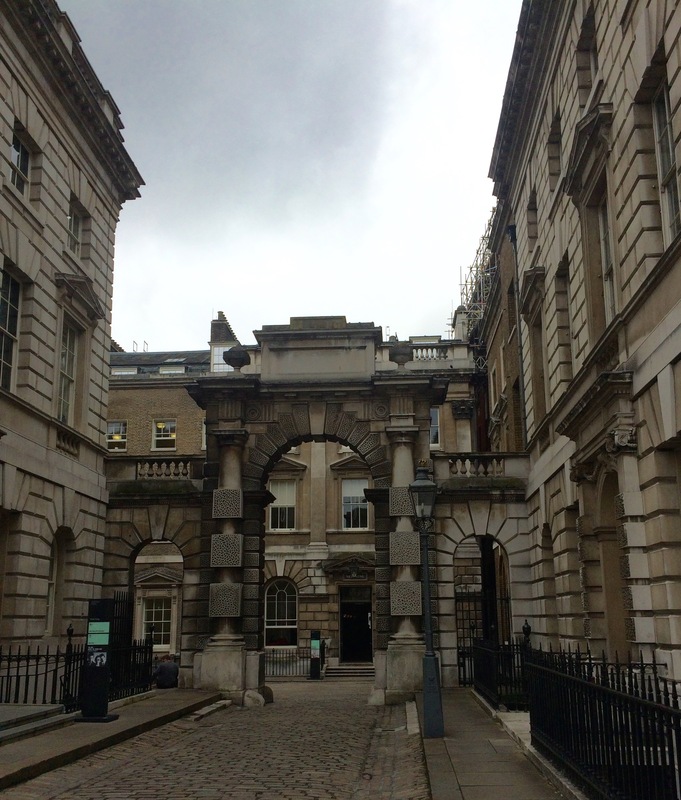 * The Courtauld – also an art college. They have an excellent exhibition on at the moment concerned with unfinished art. The thesis of the exhibition didn’t really interest me very much (concerning how the concept of ‘finish’ has changed since the Renaissance) but as usual with the Courtauld the quality of the work is worth the fee alone whatever the intellectual underpinning of the show. Standouts were Manet and Degas but I’m sure you’ll have your own favourites if you visit. ** There are few better places in London to sit and contemplate the world than the courtyard of Somerset House. With a stumpy from Fernandez and Wells to hand and the noise of the Strand left behind one can sit and read in an unusually peaceful al fresco setting. *** The New Wing actually dates to the 1850s, which made it new compared to the rest of Somerset House, which is of the 18th Century. **** Especially with the threat of text by Gary Crowley lurking in the shadows.